We have had a few drops from The Single Malts of Scotland on the mission (others can be seen here) and I am always interested to see what other treasures (or turds) Sukhinder and the team at Speciality Drinks/The Whisky Exchange have gotten their hands on. The Single Malts of Scotland range is seemingly ever expanding and the good news is I have a few more of their products lined up in the run-up to Malt Mission #200 and beyond. Good news for me, I suppose. Bowmore is one of those distilleries that I have heard equal amounts of people commend and condemn. This sort of polarity of opinion is something I absolutely love about Scotch whisky. Sure, it's not for everyone, but also every one is not for everyone. What an incredibly diverse spirit. After tasting two offerings from Bruichladdich this week, here is a distillery that actually condensed their standard line of releases. After a thorough review of their products and how they are sold, Bowmore redesigned their packaging in 2007 and actually reduced the number or expressions in their range. One thing their research showed them was that although Bowmore did brilliantly at Duty Free, they were suffering on bar shelves. The redesign of their packaging attempted to remedy this by eliminating the loops and swirls on the label and making the text for 'BOWMORE' clearer and more pronounced. For more distillery info, or to see other Bowmores had on the mission, click HERE. Tasted with MC visiting from Canada. His impressions appear in quotes. First nosing actually gets my tummy grumbling. Honey and butter on toast. Estery (crabapples and hard pears) and phenolic(sea salt, bacon, and smoke), with Bowmore smells of cleaning agents, this time countertop sprays. Chips n' vinegar, lime. Some smells of the forest, trees, oak, pine. "Mmm... I like nose." Energetic and quite smoky. Again with the cleaning agents and medicinal notes so common to Bowmore. Peat and barley drive the flavours with some sweet honey and vanilla notes interwoven with other sweets, licorice, toffee, etc. "I want to say chicken, but it doesn't actually taste like chicken." You mean the salt and pepper, KFC type flavour, or... "No, it is more the way it FEELS. You know how chicken is flavourful but not heavy? Doesn't really make any sense. Don't write any of this. Stop typing!" Long perfumy finish with some sweetness, peat, ash, and medicinal creams. "Not a strong aftertaste but it's persistent, it really lingers." "I like this whisky, there is a brief moment where it is bitter, not unpleasant, but, I dunno. I still like it." 21 years and 59% abv? Amazing to have remained so high AND to still be so pleasant on the nose and palate considering the high abv. Unique and unusual but has matured well and flavours all compliment eachother in a pretty pleasant balance. 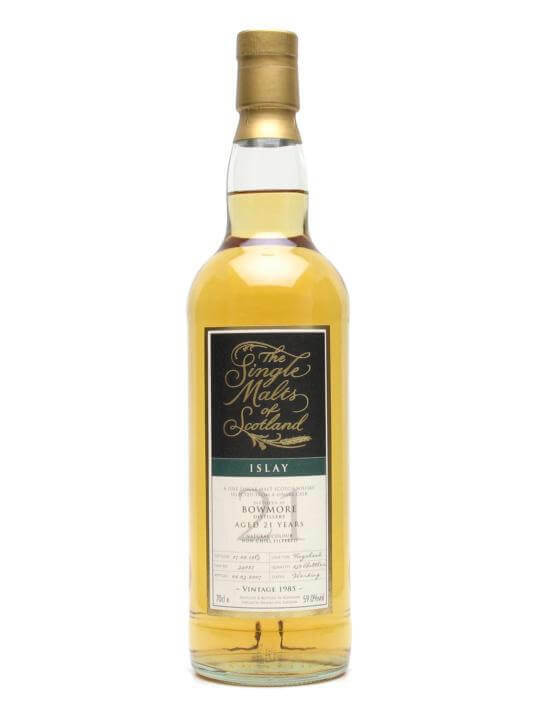 Price-wise, this beats the (old) propietary 21yo by about £100. Great whisky for turning-back-the-clock season.